Here Vala Afshar, Chief Digital Evangelist at Salesforce dissects the 2017 State of Marketing Report. Although he has an obvious commercial agenda, the insight into the growing importance of technology, particularly the use of AI plus the shift to customer experience makes for interesting reading. It's fifty pages of insights and data that provides food for thought. The implications of this study on the delivery of great communications is profound. In an era when the brand is defined more by the experience that the product, the importance of joined up thinking between communications (external & internal) and the marketing strategy becomes critical. 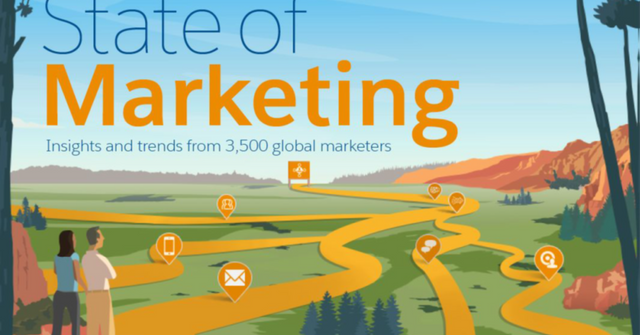 The 2017 STATE of MARKETING report includes a comprehensive set of insights and business trends from B2C, B2B and B2B2C markets. The report also includes by country profiles that further segment the technology, budget and use case trends. Upon review of this 50 page report, I extracted the 20 most powerful statistics that should be a key takeaway for CMOs and all digital marketing leaders.